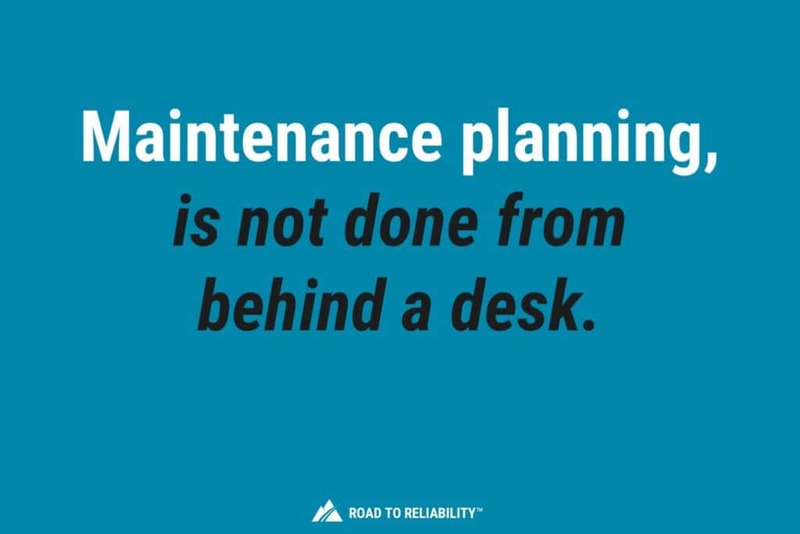 Without Maintenance Planning and Scheduling You Will Fail. 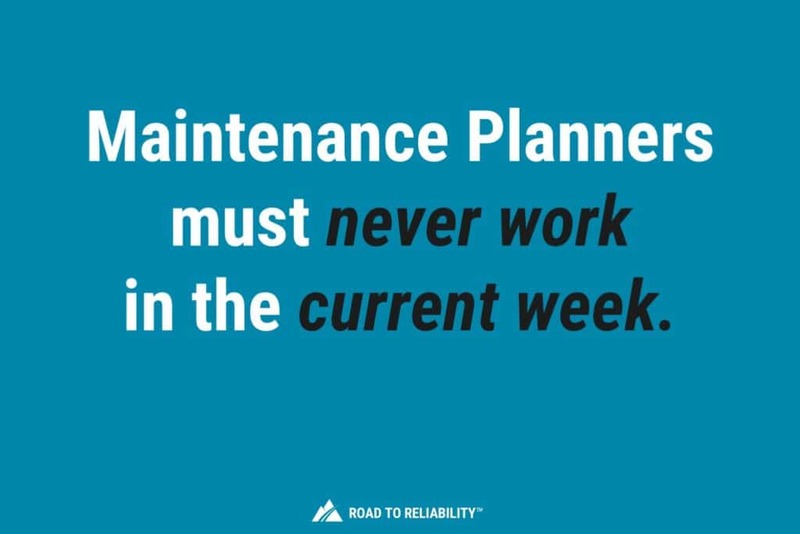 Maintenance Planning & Scheduling is one of the 4 Essential Elements on the Road to Reliability™. Planning & scheduling, or work management as it’s often called, ensures the right work gets done, at the right time, with the right tools, materials, and people. Without an effective maintenance planning & scheduling process, you’ll never achieve high reliability. In this article, I’ll explain why that’s the case. I’ll also give an overview of what a planning & scheduling process should look like. But before we do that, let me take you on a short stroll back in time. In the 1980’s DuPont commissioned the largest ever benchmarking study of maintenance and reliability practices. It included a study of 3500 sites across North America, Europe and Japan. It was so extensive that we still refer to it today. The study concluded that the top 5% of these companies, the so-called “Best of the Best” do the basics very well. And those basics include Planning & Scheduling. That DuPont study and the many studies since then have repeatedly shown that maintenance productivity is often poor, and typically as low as 20% – 30% . That means that during a typical 10-hour day your average technician only spends 2 to 3 hours doing actual maintenance work. Sometimes even less. So, when you pay your maintenance technicians for a full day’s work you actually only get about 2 to 3 hours of your money’s worth. And no that’s not because your technician isn’t working hard, it’s because you make it too hard for your people to do the right thing. The average day is simply filled with too much inefficiency and waste. But it doesn’t have to be like that. We know from those same studies that with an effective maintenance planning & scheduling process you can grow your productivity to 45%. And as you continue to improve you can increase your productivity to world-class levels of 55% or 60%. Now, you might not think that moving your productivity from a low 30% to an average 45% is a major improvement. Not something you should get excited about. Let’s assume for a moment that you work in a typical organisation in an asset-intensive industry. 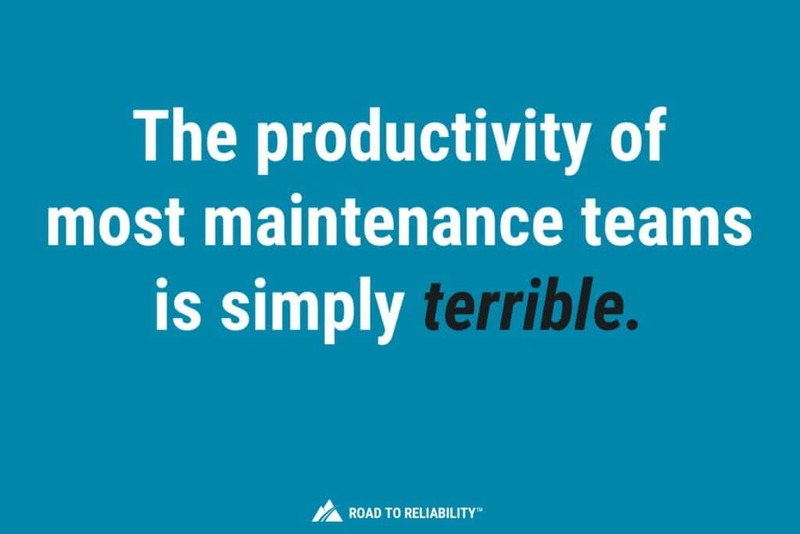 And you have a very typical maintenance productivity, or wrench-time, as many call it, of around 30%. And let’s assume you put in place a work management process and over time you increase your productivity from 30% to around 45%. In doing so you increase your productive time by 35% without increasing staffing. That means every day, every week, every month you get 35% more work done. In other words, you have just increased your workforce by 35% without hiring anybody! In a plant with 50 maintenance workers that could be worth a cool $1,500,000 per year. Maybe that is worth getting excited about? If you want to get a better understanding of how I put those numbers together, read my article How to Sell Work Management to Your CEO and you’ll see the calculations behind these numbers. And you can download a simple tool to do the same calculations for your own organisation. You achieve these productivity gains because maintenance planning & scheduling tackles inefficiencies and reduces waste. In any organisation, you will find waste, but in a typical maintenance organisation you will find a lot of waste. And bad timing of equipment isolation and shutdown resulting in excessive downtime. The more waste you have the easier it is to drive it out. But apart from driving out waste and making your organisation more efficient, an effective maintenance planning & scheduling process also brings other benefits. More job satisfaction and a greater sense of ownership among your teams. And this gain in job satisfaction and ownership is so critical on your Road to Reliability™. It starts to build a reliability culture. A culture that will naturally sustain planning & scheduling and drive continuous improvement. Better use of people’s time, with less waste and less frustration. Nobody likes to see their time wasted. Making the CMMS work for you and your people, rather than the other way around. Nothing is as frustrating as being a slave to a system. High Reliability? Not without Planning & Scheduling. As you can see, planning & scheduling drives efficiency in your workforce. You get more work done. Your work environment becomes less reactive. Teams finally find the time to get rid of those recurring problems. Your people are less frustrated and start to see the benefits of a reliability based culture. And soon enough you will find yourself on the Road to Reliability™. In the rest of this article, I’ll talk through the main steps of a planning & scheduling process. But before I do that we need to tackle one common misunderstanding. 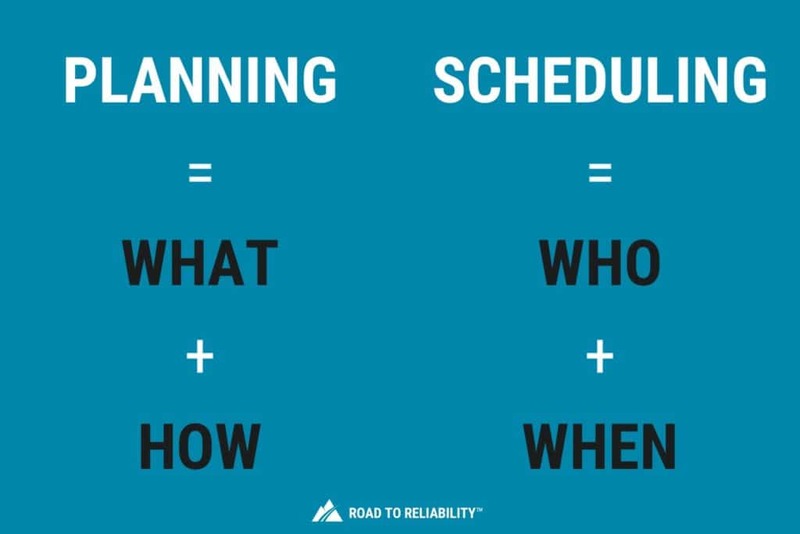 Planning is not the same as Scheduling. This is one of the most misunderstood parts of the work management process. Planning maintenance is normally done by a Maintenance Planner. Someone with a trade background, someone with extensive experience and sound technical knowledge. Scheduling, on the other hand, focuses on what work gets done when and by whom. Scheduling also looks at how you group work to minimise waste. Waste like equipment downtime, travel time etc. Scheduling also balances the workload against available resources. In simple terms, planning maintenance is about the “WHAT and “HOW” of a maintenance job. And scheduling refers to the “WHO” and “WHEN”. 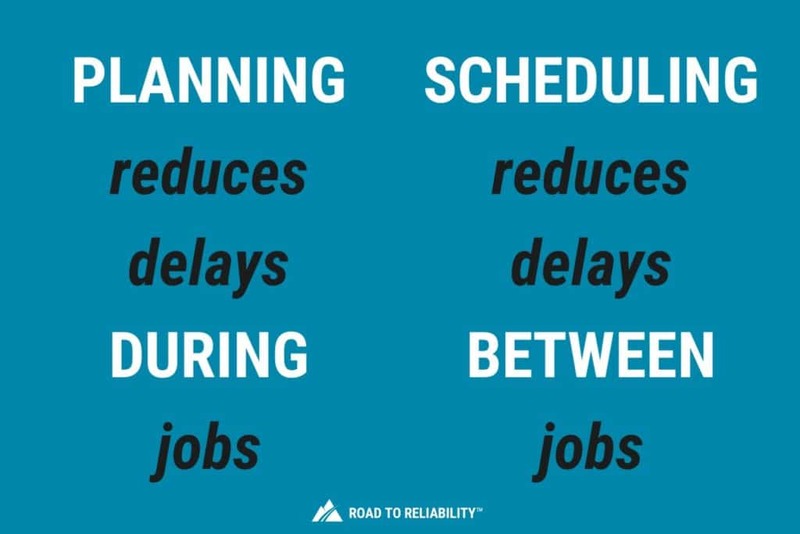 Another way to look at this is that maintenance planning reduces delays during jobs, whilst scheduling reduces delays between jobs. To succeed in improving your productivity you need both Planning and Scheduling. Planning alone or scheduling alone just won’t cut it. In the rest of this article, I’ll walk you through the planning & scheduling process in detail. Note: the process I describe here I will walk you through a corrective maintenance job that starts with someone raising a work request. The process for preventive maintenance is really the same except that the first step of the process is done – or at least should be done – as part of a structured process developing your PM program. The process starts with creating a quality work request for the new job. An Operator notices a pump has started to leak and raises a work request for maintenance to fix the leak. Proper identification of the work is essential. That way the Planner gets the right information. And the right amount of information. With this, the planner can prepare the job properly. To ensure you get high-quality work requests, create a standard for ‘what good’ work looks like. Train your people to that standard and quality check all new work requests. Review and approve all new work requests on a daily basis. Do this review jointly with your planner, supervisor, and Operations in the room. By doing it as a team effort you get better results that reflect your business priorities. You also start to instill cooperation, understanding and trust. As part of the review of the work request – and before approving it – you need to prioritize it. This is one of the most important steps in the process especially for those plants that are still in a reactive environment. The frozen weekly schedule is unnecessarily interrupted which increases inefficiency and waste. The priorities assigned to work requests in your CMMS become useless. Your planner can no longer rely on the assigned priorities. Your planner will struggle to determine what work to prepare next and become less efficient. You become the victim of emotional priorities. People start to inflate the priorities of their work requests to make sure they get done. For prioritisation, I prefer using a simple 5 x 5 matrix to risk assess new work requests. Something I will discuss in a future post. So, at the end of this step, you have an approved work request in your CMMS. One that can move to the planning stage when your planner is ready for it. Planning maintenance enables accurate scheduling, efficient execution, and quality of work. Maintenance jobs should not be planned from just behind a desk. Your maintenance planner should visit the job site to develop the scope of work. Even if the Planner knows the site well, things change. There might be temporary equipment that poses a safety risk. There could be some scaffolding left up that’s blocking access. Taking pictures of the job site, equipment, and any (access) constraints is helpful. Once back at the desk, the Planner can use these to build the job plan in the CMMS. Its good practice for the Maintenance Planner to review the scope of work can with a technician or supervisor. Especially if the planner’s primary trade is different than what the job requires. This builds a sense of ownership for the specific job with the crew who has to execute the work. And over time it will build a better understanding and buy-in for the planning process. Now, experienced technicians may not like a Maintenance Planner telling them how to do a specific job. “I have been doing this work for 20 years and I do not need someone to tell me how it’s done!” might ring familiar? But in reality, if you ask five technicians how to complete a job, you will get five different answers. And variability is the enemy of quality. It’s the Planner’s duty to prepare the most effective, efficient and safest way to do a job. And the Planner has to ensure that all the material and equipment is there to perform it. This means the Planner also places the necessary stock requests or purchase orders. The planning step ends when a job is fully scoped. Materials are on site, staged and kitted. And any external services have been (re)confirmed to be on site on the required dates. At this point, the Maintenance Planner confirms the job as “Ready for Execution”. This flags the handover to the Scheduler and is critical. Unless all the work that goes into your Weekly Schedule is 100% ready your Weekly Schedule will fail. And the expected productivity improvements won’t materialize. Once planned a maintenance job should never have to be planned from scratch again. The Planner should store all information and documentation required to do a job. Next time that job comes up the Planner simply opens the file and re-uses it. It’s the Scheduler’s job to group work in an optimised, coordinated sequence. That it’s performed at the right time by the right people. To make this happen, the Scheduler prepares a Weekly Schedule which lists all the work due the next week. The Site Manager owns the Weekly Schedule and reviews and approves the draft Schedule during a Schedule Review Meeting. This meeting is where Operations and Maintenance agree the work for the next week. Once approved the Scheduler issues the Frozen Weekly Schedule. Any work breaking into the Frozen Weekly Schedule has to be approved by the Site manager. This creates stability and drives efficiency. To develop a Schedule you need to know the available hours for the following week. So each week all Supervisors provide the Scheduler with an update of available hours. These updates take into account who is not available for work due to leave, training etc. The Scheduler prepares a draft Schedule by matching these hours against a prioritised list of “Ready for Execution” work. This matching of work against available resources is referred to as Capacity Planning. You want your Scheduler to assign work for every available work hour. You want to schedule to 100% of your capacity. Don’t allow for emergencies in your Schedule. As part of his work the Scheduler groups together jobs on the same equipment, system or location. Productivity increases if staff can move from one job to a nearby job. Or do multiple jobs on the same equipment. Grouping work on the same equipment reduces the number of isolations. It can simplify permitting. It helps to reduce clean up time, travel time, setup time etc. I strongly suggest you also track Emergency Work and Fill-In Work. Emergency work is jobs that are created and executed within the Frozen Week. Fill-In Work is existing work that was not in the Schedule but was still worked on in the Frozen Week. Tracking these 3 metrics every week will tell you a lot about the health of your work management system. The primary aim of execution is to carry out a safe, quality job. And everything we do in the work management process is to drive efficiency in this step. To maximize the productivity of our maintenance crew. This is the domain of the Maintenance Supervisor. Your Maintenance Supervisor is responsible for the crew’s safety. And the Maintenance Supervisor is responsible for the quality of the crew’s work. That means your Maintenance Supervisor needs to know his crew well and be fully familiar with their abilities and experience. The allocation of work to crew members is a Supervisor responsibility. Not the Scheduler’s. The maintenance crew executes the work based on the work packs provided by the Planner. Once the crew start work they own the work until completion. If the job requires extra materials or resources the Supervisor must source these. It is not the Planner’s responsibility as the Planner should be planning future work. Or, if the crew finds they need to complete the work in a different manner than stated in the work pack they manage this. In discussion with the Supervisor. But, in both cases it’s critical the Planner gets feedback at the end of the job. That way the Planner can improve the job plan and avoid these problems next time. As the crew progresses a job they might find unexpected work. So-called emergent work. The crew or the Supervisor must determine if they will absorb this extra work. Or if they will execute it as a separate, planned and scheduled job in the future. There are no hard and fast rules for this. Experience and common sense should dictate how you manage emergent work. But remember, the Site Manager must agree to any impact to the Frozen Weekly Schedule. At the end of each day the crew report progress to the Supervisor for all their jobs in progress. They complete work history and technical history in the CMMS as appropriate. The Close Out step covers the reporting of technical history, work history, and areas for improvement. This is one of the most important steps in the process as without there is no improvement. Unfortunately, it is also one of the steps that many ignore. Analysing your performance is essential to getting better. You won’t jump from a low 20% or 30% productivity to a world-class performance. That takes time and continuous improvement is the name of the game. This should take place in various ways. First of all, continuous improvement should happen within the planning & scheduling process. As part of routine activities and reoccurring meetings. For example, the review of Schedule Compliance during the Weekly Schedule Review Meeting. Or the feedback loop from the execution crew to the Maintenance Planner. With the crew providing feedback on the quality of the job plans. Second, you should have regular reviews on the planning & scheduling process. Get your Supervisors, Managers and Senior Executives to conduct Planning & Scheduling Gemba Walks. find out what works well and why. find out what issues frustrate or concern individuals most. discover opportunities for improvement and for your Leaders to see how they can help. And finally, you need to conduct a formal, annual Maintenance Planning & Scheduling Process Audit. A process audit is where you get your process owner to spend a day or two in the field or on the shop floor to assess the health of the process. Spend time with the execution crews. With the Planners, Schedulers, and Supervisors. Agree what areas for improvement you will focus on. What you need to sustain. To succeed with work management you need to understand that there are three key roles in the process. These roles are the Planner, Supervisor and Scheduler. And in principle they need separate people. The Maintenance Planner must prepare the most effective, efficient and safest way to perform a job. And the Planner has to ensure that all the material and equipment is there to perform it. The planner role requires detailed technical and equipment knowledge. Your planner is typically someone with a trade background. The Maintenance Planner focuses on future work. The Planner should not work in the current week or the positive impact on crew productivity is lost. The Scheduler’s job is to prepare a Frozen Weekly Schedule. The Schedule must balance available hours against agreed work priorities. And the Schedule must drive efficiency. During the current week, the Scheduler monitors and reports progress. And may help your supervisors manage the impact of break-in work. The Scheduler coordinates the collation of weekly and monthly performance indicators. A final task of the Scheduler is to develop a 12-24 months look ahead. This flags major maintenance well in advance, which is critical to managing long lead items. It also helps to group to maximize efficiency and reduce downtime. 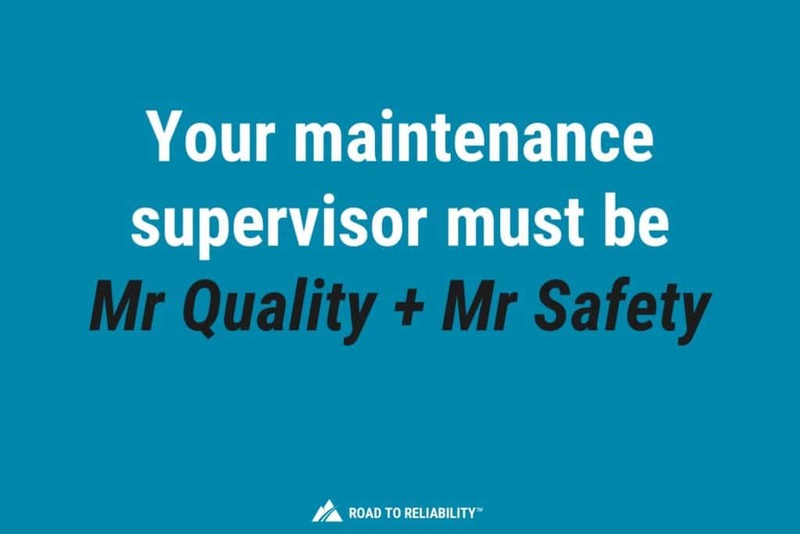 The Supervisor is Mr Quality and Mr Safety in one. The Maintenance Supervisor assigns work and ensures it’s executed safely and to the right quality standards. The Supervisor also plans any emergency work within the current week. As you can see, the Maintenance Planning and Scheduling process is in itself easy to understand and not hard to do. So why is it that so many organisations struggle with? Why do so many organisations have terrible maintenance productivity? We address these mistakes and much more aspects of implementing planning & scheduling in our article: How to Implement Maintenance Planning & Scheduling. Do you have Maintenance Planning & Scheduling in Place? Do you think planner, scheduler, supervisor and crew technical must be managed by the same person or they can be manager by two different departments like production department and maintenance depatment? Hi Chamkhia, the most important thing is that people perform their roles as per the planning & scheduling process. I have seen both models work where planners, schedulers, supervisors and technicians all are within a single department managed by the same person. I have also seen where the execution part (supervisors and technicians) sit within a different department (e.g. Operations) and planners & schedulers sit within the maintenance department. What you want to avoid is having your planner reporting into the same supervisor as your technicians – then it becomes too easy to use the planner for day-to-day issues and emergencies and then your planner is no longer planning future work. The value of the planner role is then undermined. Based on our new CMMS system set up 2 years ago, i successed to hormonize all the process that you speaked about and i still trying to improve it. I do the role of planner scheduler and supervisor (when supervisor on my department was busy by other activity), the technician was on production department and for me it was the most complication thing for performing process. Hi Chamkia, I can see why that would have been a challenge. Have a read of the article on how to implement planning & scheduling. A good article and I agree with your discussion points, as I have spent many years involved in coaching and presenting these same fundamentals of Planning and Scheduling across a variety of industries. I have observed similarities or examples as discussed in these posts in all maintenance teams when it comes to success or lack thereof in Planning, Scheduling and Execution of scheduled work. I think the Role of the Supervisor has been a little understated, the Supervisor has significant influence in the success or failure of the Planning and Scheduling, I believe the Supervisor’s role must also include being a Champion of the Planning and Scheduling process. It is the Supervisor who makes the decisions on what work is performed. The Supervisor role certainly includes Safety and Quality, but the quality work performed safely may not be in the current Schedule. The Planners, Schedulers and Supervisors must be a team and support each other. I would like to ask to you what should be the proper ratio between planners/schedulers/supervisor/relability engineer’s VS traders. What should be the ratio if the same person performs both roles (planner+scheduler) vs traders. Definitely planning & scheduling is the hub of work management. Maintenance Productivity will improve with effective P&S. However, the mindset, sometimes the incompetency, the priorities set by management, the non visible cost of non productivity, and the non full involvement of management in the process are the main reasons why P&S is always an issue. From my experience management talk about the importance of P&S but in reality are not on top of it. In my previous company we implemented an Integrated Operation Activity Planning & Scheduling Process which handles all activities in the field (plan includes only activities which impact major business objectives,i.e. production, integrity, water & gas injection targets). Most people were happy about this and saw the benefits but management were not giving too much interest. Management usually absorbed by other things coming from top management. Also availability of tools & processes that help productivity is not being measured against the investment, what is the gain in productivity if i invest in tools & processes that ensure effective P&S? Furthermore most planners are now more into the CMMS & forget that this is just a tool to help them. Also sometimes planning (i.e. work preparation+plan) are handled by different entities. A pragmatic article that covers the topic well. Not many companies understand or apply many of the required planning and scheduling principles and wonder why productivity is so low or tool time is not increasing. In the Oil & Gas Industry the only measure is planning efficiency which is interpreted as bums in beds. We occasionally role out the best practice when turnarounds occur. So much more could be gained from having a well defined process applied, with the right planning tools and resources. Hi Erik, great article and I agree will all your points. At my site we see that ’emergency’ and non planned work are being resourced trumping the fixed weekly schedule work. As a result we see slippage in our schedule adherence metric. The emergency work can sometimes just be poorly planned by the requester but because of the timeliness it must be acted on. Have you any suggestions for setting rules and what to prioritize? First I would suggest that in addition to tracking weekly schedule compliance (adherence) you also track what I would call ‘Emergency Maintenance’ which is work that was identified and executed in the frozen week. You should to get this < 5% and eventually down to < 2%. And also track what some people call "Fill In Work" that is work that is already identified (and should be planned) but was not scheduled for the week. I always like to use these 3 metrics combined as they give a more complete picture of whats happening than just schedule compliance.Then you need to make sure that your schedule is owned and approved by a senior person on site that sits across both production/operations and maintenance. He/She should own the outcome for the 3 metrics and any break ins to the frozen weekly schedule should be approved by this person.For prioritisation I strongly recommend using a risk assessment matrix. Ciao Erik!, an interest summary of what should be the loop, Plan-Schedule-Execution-Feedback and improve, I worked for long in this kind of maintenance environment and I could note some issues that you could certainly share your opinion with me, for example more works orders that the mechanical planner can deal with, with the consequence of the acumulative backlog, few disponibility for production departments for give the necesary time for the execution of the maintenance planification programs and frequently changes escenarios that the scheduler have to deal with, always with few time to arrange the resources and others and few time to get toghether the planner with the supervisor before and aftet maintenance task with the real and formalized feedback to improve countinously the maintenance plans. Would you give me a sugestion how to implement this maintenance management scheme from zero, including not having a CMMS sofware, a real case, thanks. Hi Eduardo, looks like you have your work cut out for you. You could run a planning & scheduling process without a CMMS just using paper-based system like in the old days. But I would not recommend this, CMMS software is not expensive anymore. You don’t need to have a major system you can run with a smaller low-cost solution. So get a CMMS, then set up your asset register and then build your PMs and implement a planning & scheduling process. Trying to do all this without a CMMS would be unnecessarily inefficient. It is my understanding that you refer this article from the perspective of the maintenance manager who eventually does have the role of prioritizing work in cooperation with operations manager and bridges all the parties in the process. That is probably possible in small organizations, yet my approach is that in larger plants there should be another function in the scheme, and that is what we call a coordinator. This person will review the work requests and issue the work orders with a priority rank attached to them. Then the work orders follow the process of planning and scheduling as outlined by you, with the coordinator bridging the gaps in the process: materials ordering timelines, schedule completion, updating operations on the status and potential work dates, evaluation of emergency requests and schedule of break up work and so on. The coordinator job can also be executed by a senior planner who does have a broad process and maintenance understanding and who will direct the planning process as well. Your feedback is appreciated. Thank you. Hi George, thanks for your comment. The article is not specifically written from the view point of a maintenance manager, but more outlines the key aspects of a succesful planning & scheduling process. I strongly believe prioritisation must be done in a team environment with both maintenance and operations in the room, not just by a single person (or coordinator). In my view the weekly schedule should be owned by a senior person in your plant who sits across both maintenance and operations , he/she should therefore also make the call whether something urgent enough to be deemed emergency maintenance and thus break in to the frozen weekly schedule. Protecting the schedule is key to stability and that stability enables efficiency. And prioritisation is key to protecting the schedule. A lot of the other tasks you assign to a ‘coordinator’ are what I would consider the role of the maintenance supervisor. ALL The steps in the planning & scheduling process I outline the article are essential and must be completed, but there is some flexibility about who does what. How you structure yourself will depend on your plant complexity, size, organisational culture, people’s capabilities etc. Thanks, Erik for the article which is a great summary of AP 928 which the work management process standard adopted by my company. Thanks Ken, have to admit that I’m not very familiar with AP-928 which I believe is a work management standard for the nuclear industry?